The women from faraway Valpoi town and Sattari taluka who are left to fend for themselves are now transforming their lives. These women would tend to the rice fields during the monsoons would be left helpless and as home makers and would have to depend on their husbands to ask for any money to purchase even a comb in the village market. But these women have latched on to a training programme in bamboo art and handicrafts organized by the South Asian missions through the Directorate of Rural Development in Valpoi and Pernem and that’s how they were introduced and taught bamboo and cane handicrafts. “Bamboo grew wild in the village and we were not aware that so much could be done and we could actually make a livelihood of bamboo and cane. Over the years we learnt to thatch things together, cut the cane to the right thickness, add colour and designs to our baskets, bags, storage containers and lamp shades,” explains Rukmini Narayan Parvar. 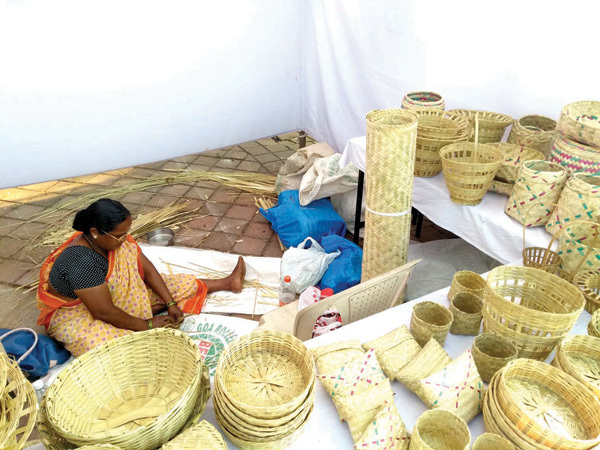 Rukmini speaks to us on the sidelines of the Goa – Bengal Folk Mela at Ravindra Bhavan and explains how she’s left her family back home over 45 kms away and has relocated to Margao for about eight days to sell her bamboo and cane handicrafts. Rukmini explains that she and another 20 odd women in their village in Valpoi belong to Self Help Group namely Savitri Phule Self Help Group and they look to empower themselves and travel to various government and private run art and cultures fairs like Directorate of Rural Development organized SARAS Festival or Earth and Farmers Markets organized in Panjim, Salcete and Mapusa to sell their handicrafts. “It’s a difficult skill to entwine the bamboo or even slit the dry bamboo. Also requires long hours of being seated on the floor and working on these bamboo thatched containers that we sell. But there is a huge demand for it and it’s definitely changed our lifestyle with the women having some income to spend on themselves and their children,” explains Artha who accompanies Rukmini at the Folk Art Mela. Rukmini and her Savitri Phule Self-help Group explain to us that they face stiff competition from plastic containers which has a longer shelf life and durability when it comes to making and selling baskets or containers to sheaf the rice. “But Bamboo thatched baskets are not just aesthetically better but also healthier. Bamboo with eatables and fruits can be kept in the hot sun with no harmful effects compared to plastic based storage containers. I hope Goans will stay true to its tradition and patronized our baskets and containers and inspire more people from our community to continue this activity. But for now Rukmmini is glad that the women of her village took the plunge and are self-satisfied and have finances for their basic needs and not depended on their husbands alone.